Resicast continue to expand theri range of WW2 British and Commonwealth Troops with the addition of a Royal Marine Commando. 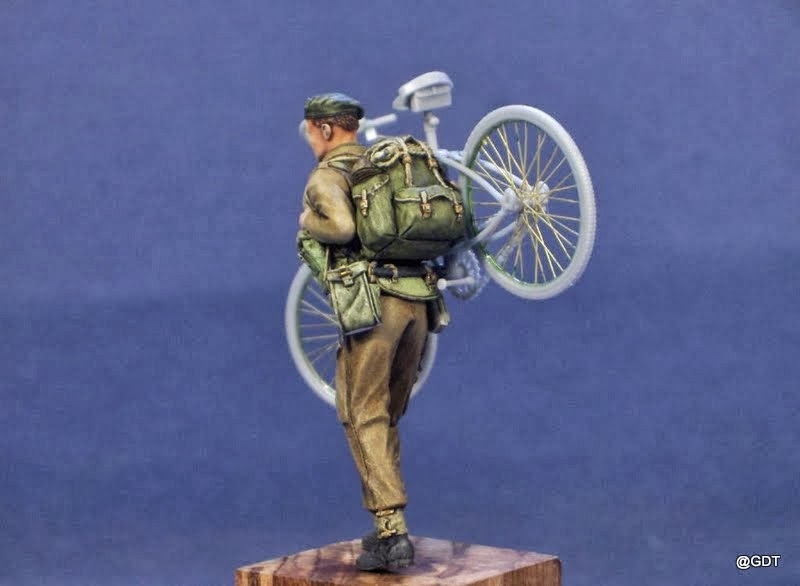 The figure is duel purpose and can be used with the Diopark British WW2 Military Bicycle or as a stand alone figure. This is a first look at at the figure as I don't yet ave the box art or final combination. The figure will come packaged in the standard Resicast format for small items, namely 2 x zip plastic bags. The card insert should show the product and manufacturers details. The figure is cast in a light grey resin and was free from any damage or cause for concern. The figure consists of 13 parts. The body cast as a whole with the left arm cast attached. Two separate arms (2 right) and heads (2), bergen, short stabbing bayonet, commando knife, water bottle and respirator haversack, webbing for the digging tool and two small straps for the bergen, plus the choice of No 4 Mk Rifle or Thompson SMG. The SMG is attached to the extra right arm mentioned. The casting and detail are excellent. The body wears Battle Dress Serge 37/40 with the blouse having the pleated pockets. Under the blouse the figure wears a polo neck jumper. Webbing comes in the form of right and left ammo pouches, the left being open slightly, 37 pattern belt and shoulder straps. The equipment has nice buckle and brass detail. Also across the chest is a strap for the respirator haversack to attach to. Battle dress trousers, anklets and ammo boots complete the figure. All the right pockets are present in the right place and the uniform has nice folds and detail. Detail on the uniform and equipment is excellent. To complete the figure you get a choice of two heads, one wearing the traditional Commando beret and one wearing a cap comforter. Both the faces are nicely detailed with a somewhat pained expression on each, as the faces appear very similar if not the same on each head. You get two right arms with the figure. 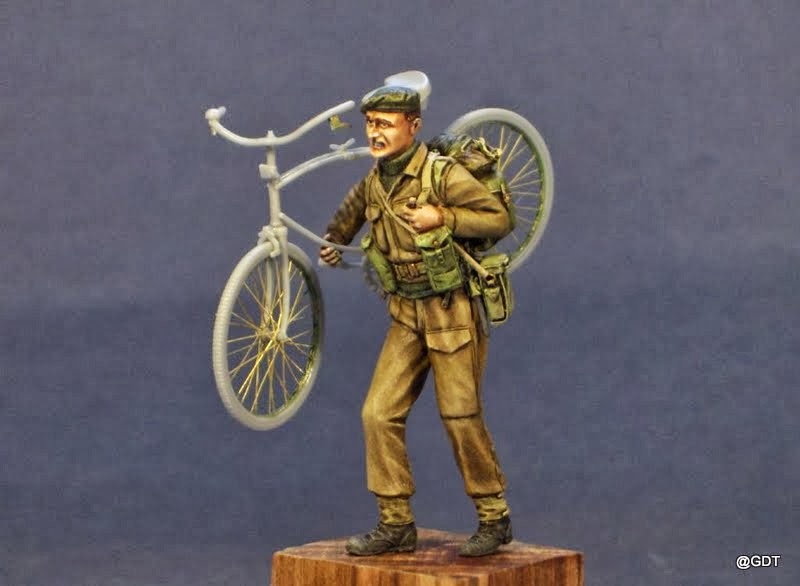 One is designed to be used carrying the Diopack WW2 British Bicycle (not included in the kit) and the other carries a Thompson ,45 sub machine gun, so you have a choice of how you wish to finish the figure. Equipment comes in the format of a very nicely detail WW2 bergen, a water bottle, respirator haversack, digging tool carrying pouch, a short stabbing bayonet and a sheathed Commando killing knife. A No 4 Mk I rifle is supplied for use with the bicycle carrying version or a nicely detailed .45 Thompson SMG is supplied with the right arm if you choose that route. Finally two long straps with buckles are supplied for your use. The figure stands at approximately 44mm heel to shoulder. The figure is of a slim build, but should be perfectly acceptable with all the kit attached. Special forces are always a popular subject and Commandos are no exception. It is my understanding that this figure will be joined by a second figure in the near future. This would make sense as the Diopack bike set has two bikes. The bike makes him more or less D Day specific but the alternative arm with the Thompson SMG should widen the scope for use. The addition of the bergen is a nice development to see and these have been released in a set of 5 different styles as a separate item should you need some for you troops. The detail on these is 1st class as is the detail on the figure. This chap should be of interest to both figure painters and diorama builders alike. A welcome addition to the Resicast range. I have enclosed some images form the Resicast web site of the built figure for ease of reference.